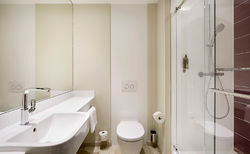 Premier Inn offers premium quality at economy prices for soundest sleep. 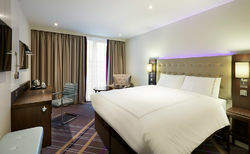 With over 750 hotels and 70,000 rooms, Premier Inn guests are never far from a great night's sleep at fantastic value rates. Since 2016, the largest hotel group in the UK and Ireland is setting foot on the continent. The company's first hotel in Germany, Premier Inn Frankfurt Messe, has held an ongoing top position on the travel review website TripAdvisor since its opening in early 2016. The site has also received a Certificate of Excellence in 2017 and got awarded with a Travellers' Choice Award in 2018. What a great start of building the premium economy brand in Germany. Since 2016 we’ve been proactively growing our pipeline: With our first acquisition in Germany, we have acquired 19 hotels, comprising 3,100 rooms. In addition to our organic pipeline, this will ensure we have at least 31 hotels – comprising 5,720 Premier Inn rooms, by 2020. Our openings plan will start with a new hotel in Hamburg and two in Munich, due to open later in 2018/19. To continue building a portfolio of great sites in key German cities, Premier Inn is looking for long-term development partners in Germany. 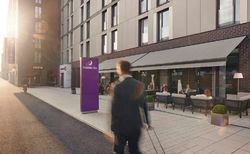 Premier Inn's parent company Whitbread plc, founded in 1742, is a successful FTSE100 company with a history of over 250 years of continuous growth. In 2017/18 Whitbread's turnover was GBP 3.3. billion. As the UK's leading hospitality business in the world, and the restaurant brands Brewers Fayre, Beefeater Grill and Table Table. Are you a property developer or a site owner in our target cities? Please get in touch with us – we look forward to working with you.